Click here to get personalised directions using Google Maps (simply enter your starting point). If you have Sat Nav, please use our postcode: DL12 9ED. 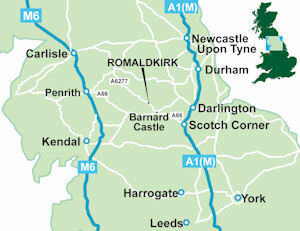 Romaldkirk is situated on the B6277 six miles west of Barnard Castle, 20 miles from Scotch Corner and about an hour from Penrith M6(Junction 39). 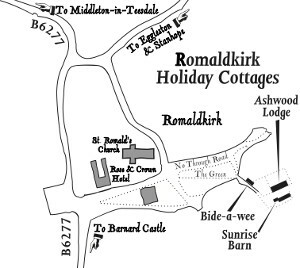 Enter the village of Romaldkirk and at the church corner, take the no through road opposite. Take the first turning on the right which crosses the village green. 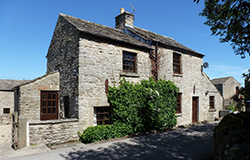 The cottages are situated at the end of this lane. Rail access from the main line station at Darlington with a taxi to Romaldkirk (approximately 30 minutes). There is also a bus service from Darlington. 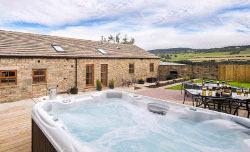 By air Durham Tees Valley Airport is about 35 minutes by road and Newcastle Airport is just over an hour by road.